Inspired by the colour, lines and energy of city life, Tez expresses his unique style through a diverse range of media. 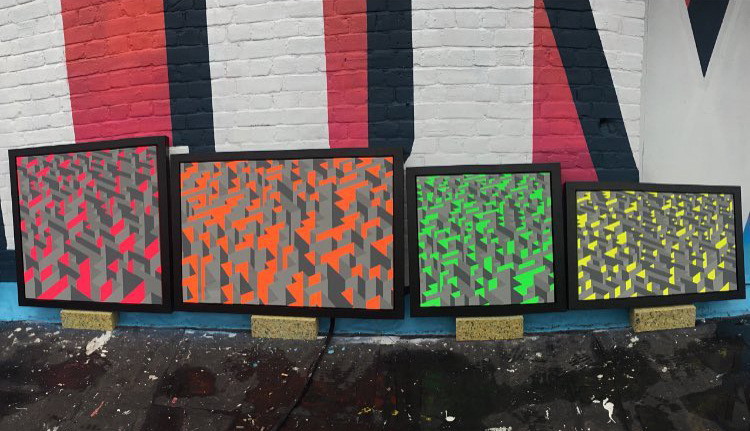 Working alongside renowned street artists, he has established his recognisable geometric shapes that allow for playful interactions between his art and its audience. He uses intricate stencil methods such as screen printing, taping and paper cutting to create fine art screen prints and wallpapers, as well as spray painted murals and painted canvasses. Multiple commissions include exterior murals, residential and business interiors, wallpaper designs and personalised canvasses. TEZ is exhibiting at Well Hung Gallery for the Chroma Form exhibition 4 AUG – 4 SEPT.